(Bloomberg) -- Dow Inc. outperformed the S&P 500 by more than 10 percentage points since it started "regular way" trading on April 2. That makes Bernstein analyst Jonas Oxgaard happy that he was wrong in his prediction that the stock would sell off immediately after the spin-off. Dow Inc. completed its spin from parent company DowDuPont Inc. on April 1 and the stock immediately surged, leading to about a 21 percent gain since it started trading on a "when issued" basis on March 20. The S&P 500 was up only about 1.5 percent over the same time. Oxgaard, the top bull with the highest price target on Dow, didn’t expect this move at all. In fact his call was the complete opposite. 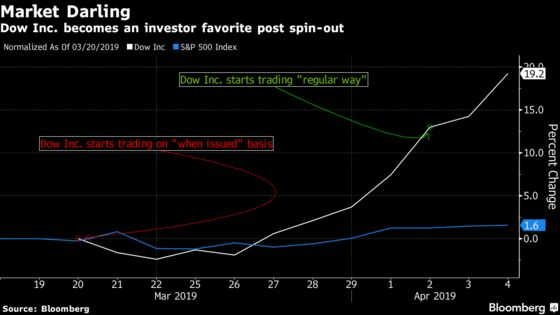 "We expected Dow to sell off in the first few weeks of trading and, while it is still early, we clearly misjudged sentiment here," Oxgaard wrote in a note to clients. Oxgaard is relieved and happy at the same time to get the short-term call wrong. "We’re not particularly upset about being wrong here –- after all, we think the shares are worth considerably more than $60 (our target price is $75), but the speed of this move surprised us," he added. Dividend Yield: Market likes Dow’s more than five percent dividend yield, which Goldman said is "best-in-class"